The folks at Cosmoquest have released a cool new citizen science app for Android! “Earth or Not Earth” allows players to test their knowledge of Earth, as well as learn more about the fascinating geology of the rocky worlds in our solar system. You can also challenge your friends on Facebook to beat your scores, thanks to the Facebook integration feature. “Earth or Not Earth” was developed by Southern Illinois University graduate student and Cosmoquest developer Joseph Moore. Moore designed “Earth or Not Earth,” and included two additional game features: “Matching” and “Pick 2.” The images used in “Earth or Not Earth” are public domain, and are sourced primarily from NASA planetary science missions, with more images to be added to the app in the future. The app does cost $1.99 USD, and the Proceeds from “Earth or Not Earth” help fund the programmers at Cosmoquest, as well as citizen science programs, educational programs, and future mobile apps. 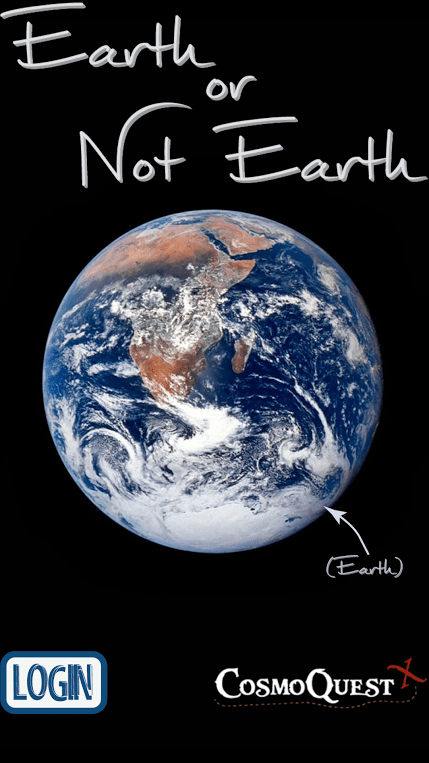 “Earth or Not Earth” main menu – Click to embiggen. The user interface for “Earth or Not Earth” is pretty straightforward. After installing the app, the initial screen will prompt users to login with their Cosmoquest credentials (or create a new account). While some may see this as an annoyance, a Cosmoquest account allows access to many of the other citizen science projects Cosmoquest offers, such as Moon Mappers, Asteroid Mappers, and others. After logging in, users are able to select one of several game-play options. Players can start with the “Learn” section, which allows users to learn more about the rocky worlds in our solar system. Additionally, users can learn about geologic features such as craters, volcanism, fault lines, and even man-made surface alterations. After learning about the processes that shape and alter rocky worlds in our solar system, users can test their knowledge with the “Earth or Not Earth”, “Matching”, or “Pick Two” mini-games. “Earth or Not Earth” Displays images from various NASA planetary missions. The goal for the player is to determine if the image is of Earth, or Not. For those looking for a greater challenge, the “Matching” minigame provides an image that players must try to match to a rocky world, or a planetary geology process. The most challenging mini-game in “Earth or Not Earth” is “Pick Two”, where players select two images that belong to the same world out of several shown on screen. With some images being in color, and others in black and white, players must rely on the knowledge gained from the “Learn” feature to make educated deductions about which images belong to which world. Fans of planetary science will find “Earth or Not Earth” a challenging, yet entertaining and educational gaming experience. Gameplay is quick, and makes for a nice break between meetings, or something to pass the time while waiting to catch the bus.